The Blue Hawaii joined the cocktail canon in 1957, just two years before its namesake island chain attained statehood (and four years before the release of an Elvis Presley movie with the same name). It was in Honolulu, at Waikiki’s shore-hugging Hawaiian Village Hotel, that head bartender Harry Yee was credited with first mixing up the Day-Glo drink that offered a taste of the tropics. 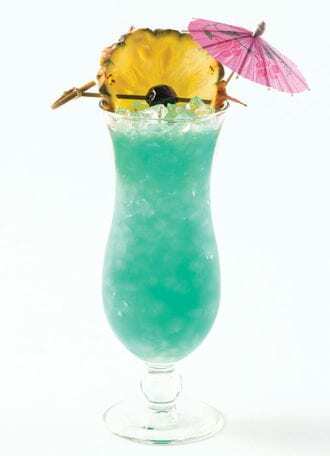 The combination of rum, vodka, pineapple and sweet-and-sour mix, rendered oceanic in color by the addition of blue curaçao, was so convincing, some even claim to recall Yee holding up each Blue Hawaii served to ensure the drink’s color mimicked the Pacific just beyond. In Chicago, The Pink Squirrel serves a variant that swims closely to the original. Made with equal parts vodka, rum and blue curaçao, shaken with fresh pineapple juice and a house sour mix, it’s an attempt to revive midcentury as modern. Combine all the ingredients in a shaker with ice and shake to chill, then strain into a hurricane glass filled with crushed ice. Garnish. House Sour: In a saucepan over medium heat, combine 1 cup of water and 1 cup of granulated sugar, stirring until the sugar dissolves. Remove the syrup from the heat and allow it to cool to room temperature, then add 1 cup of fresh lemon juice and ½ cup of fresh lime juice and mix well. Keep the remainder refrigerated for up to 1 week. The Hurricane cocktail, all grown up.